Coffee cakes. The best recipes. The following recipes were very kindly shared with us by our good friends in Cork. We made them at home and they are to die for! “When we first opened our café at The Pavilion Garden Centre about 6 years ago, we introduced this recipe for coffee cake using a shot of GREENBEAN espresso and it truly has remained a favorite ever since. It’s so easy to bake and definitely worth a try!” – Pavilion Café. Cream butter and sugar till pale and beat in eggs 1 by 1. Mix in flour gradually and add the GREENBEAN espresso and extract. Mix well to dropping consistency, if mix needs it add a little hot water. Spoon mix into two greased and lined 10 inch tins. Bake for 30-40 minutes at 155 degrees Celsius until cakes have risen and firm to touch. You can check with a cake skewer to see if the coffee cake is cooked, the skewer just comes away from the sponge clean. Place onto baking racks and allow to cool. Ice cakes with a coffee vanilla and walnut butter icing. 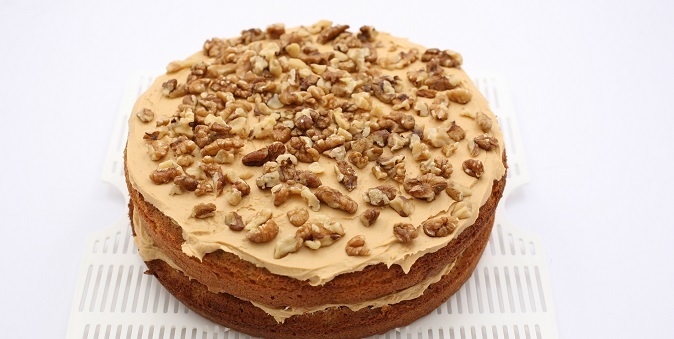 Whisk butter and icing sugar till pale and light, add both extracts and walnuts and whisk again. Spoon 3/4 of icing onto base cake and sandwich with the other. Ice top of cake with remaining icing and decorate with chopped walnuts.